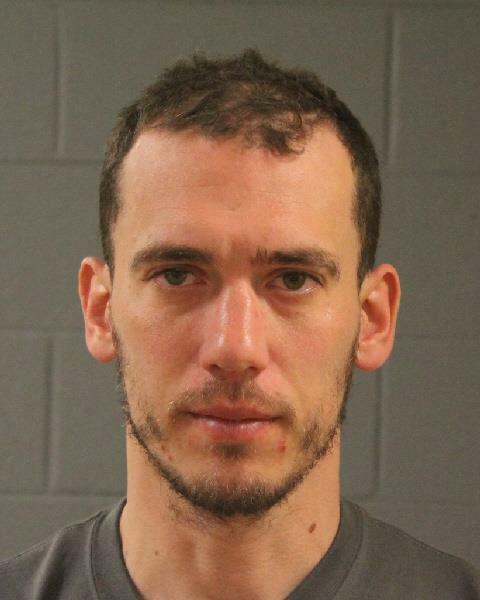 ST. GEORGE — A Connecticut man was arrested on burglary charges after a woman arrived at work Wednesday morning in St. George to find an unknown man in her office who had allegedly spent the night, arranged the furniture, had written with marker on the ceilings and walls and tried to cool down a room to make ice cream by opening a refrigerator. At approximately 8 a.m. Wednesday, officers responded to a burglary report at the Utah State University Extension Office located at 475 S. Donlee Drive in St. George after an employee arrived at work and noticed things were amiss, according to a probable cause statement filed by the St. George Police Department in support of the arrest. As the employee walked inside the building, she told police, a man walked out from the office hallway holding a laptop computer. The employee left the building and called 911. The man walked outside, set the laptop down outside the building, got in his vehicle and drove away. The employee was able to get the man’s license plate number to give to police. The license plate was registered to 35-year-old Richard C. Zeh, of New Britain, Connecticut, according to the statement. When police went inside to clear the building, they noticed large signs had been moved, the refrigerator and freezer doors were open and large containers were stacked in front of it, the report stated. Police observed writing on the walls and ceiling in blue marker and chairs in the conference room stacked on a table with an American flag draped through them. Police found personal items on one table, according to the statement, including receipts, a business card and papers with Zeh’s name on them, cash and a Wingate hotel room key. Around that same time, police received a report of a person, later identified as Zeh, walking alongside his moving car a few blocks north of the business, the report stated. Police responded and asked Zeh if he had been the one inside the office at the old airport. Zeh told police it was him. He told officers that he went inside the building when it was still open and sat in the waiting area for a while before going upstairs and falling asleep on a couch, the report stated. When he woke up, he said he decided to clean the building. Zeh also told police that a cleaning lady had been at the office that morning and that she asked Zeh who he was. Zeh was arrested and booked into the Washington County Purgatory Correctional Facility. He was charged with third-degree felony burglary, along with two class A misdemeanor counts of criminal mischief and theft. Judge Eric Ludlow, of the 5th District Court, ordered $10,000 bail for Zeh’s release pending trial. He was found indigent by the court during his initial court appearance Thursday and will be represented by court-appointed attorney Ariel Taylor. He is scheduled to make his next court appearance Monday afternoon. It sounds like he was mental but calm which suggests Not meth / crack but some type of neurological disorder . A follow up report about whether testing showed some type of drug or not would be informative .